Beat the goat blanc in a mixer for 30 to 45 seconds to loosen and lighten. Grate in Manjimup truffle, stir well to combine and reserve. Peel the bases of the asparagus and trim off 1 centimetre. Boil the asparagus for 2 minutes in salted water, remove and season. Drizzle with olive oil and keep warm. Wipe the bread with the cut side of the garlic clove and brush with olive oil. Barbecue or toast until golden and place onto serving plates. 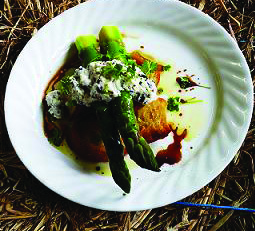 Place asparagus on top, then a quenelle of the “truffled” goat blanc. Drizzle with olive oil and organic grape syrup.